Whew! The past few weeks have been extremely busy for our family. I am sure your family has been busy, too! 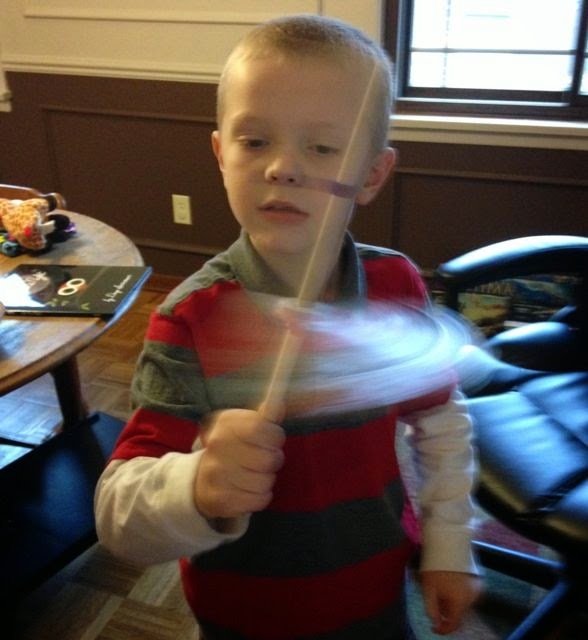 Our heads are "twirl"ing from "somersault"ing from one family holiday celebration to another. Thankfully we found the time to "wiggle" in a birthday celebration for Divya Srinivasan. Last November, I met Divya Srinivasan at the Mazza Museum Fall Weekend Conference. After she shared her birthday with me, I asked her to write it in the book she was signing for my children so I wouldn't forget! She said, "I have never been asked to write that before." Then, she told me that her birthday was forgotten by friends when she was younger because it was right in the midst of the holidays and during vacation. I thanked her for sharing and promised we wouldn't forget her birthday this year. 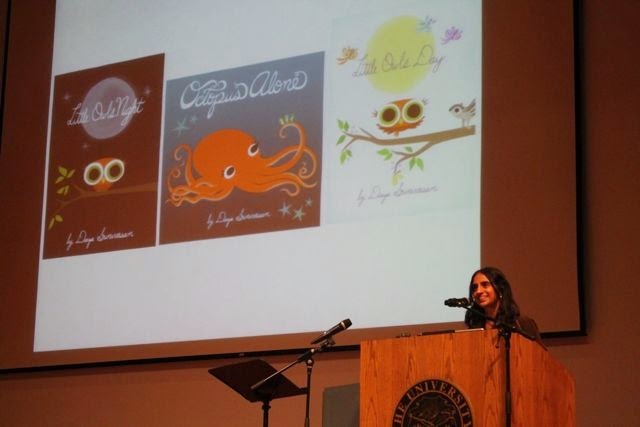 Divya Srinivasan is the author and illustrator of three picture books including Little Owl's Night and Little Owl's Day. As a child, she loved drawing, but she never thought she would grow up to be an artist. Art classes in school "stressed her out" but she enjoyed creating art for herself on her own time at home. (Mazza Museum Fall Weekend Conference Keynote). In college, she wrote a comic strip that was published in twenty college newspapers. She described this experience to Design Sponge, "It was the first time that I knew so many people were looking at something I'd made, but still got to remain pretty anonymous." Also in college she began to experiment with animation. A college course provided an introduction to animation, but her own curiosity inspired her to create short animations on her own. After college she worked at a consulting firm for one year. On the job she learned how to use Photoshop which she now uses for her picture book illustrations. (Mazza Museum Fall Weekend Conference Keynote). In 2000, Divya had her first assignment as an animator for the film Waking Life. 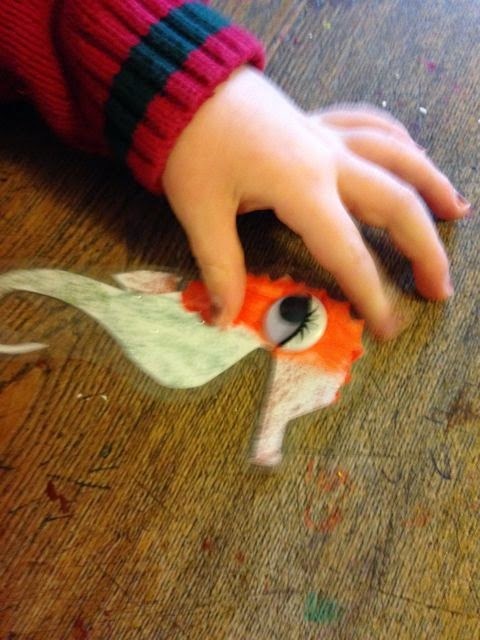 On this project she used a tablet and a pen which are the instruments she uses for her picture book illustrations. The success of Waking Life gave her many more opportunities including creating album art for Sufjan Stevens and music videos for They Might Be Giants, Weird Al Yankovic, and The Octopus Project. She created artwork for Peaceable Kingdom which has been used for greeting cards and stickers. Her artwork was used for the apps Peekaboo Barn and Peekaboo Wild, too. Despite all of these projects, Divya felt unfulfilled, "I wasn't getting as much freelance work as I'd have liked, and I hadn't done an independent project of my own in years, so it was time." (Indian Moms Connect). In 2009, Divya Srinivasan wrote and illustrated a story that would later become Little Owl's Night. The setting of a night forest was inspired by animation projects she had worked on in the past. 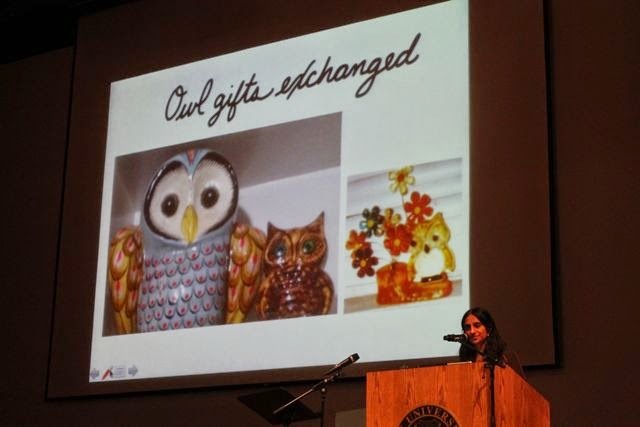 The main character, Little Owl was inspired by owls that were purchased at thrift stores and exchanged with a friend (pictured below). The first illustration she did of an owl later became the cover for the book. The completed artwork and story were acquired quickly and the book was published in 2011. The sequel, Little Owl's Day was published in September of 2014. 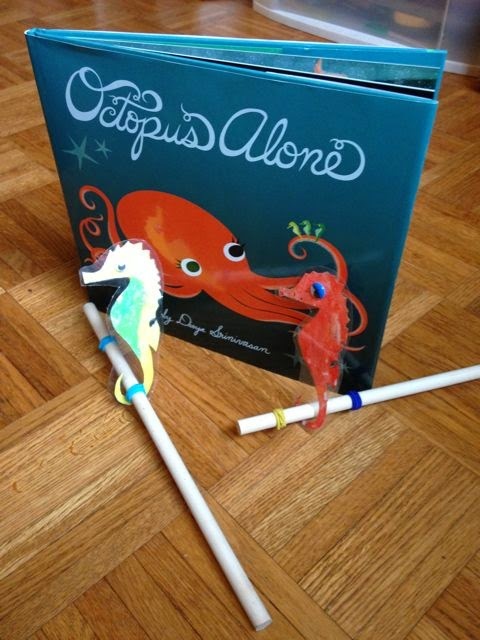 I purchased Little Owl's Night and Divya Srinivasan's other book Octopus Alone as Christmas gifts for my children. However, I knew we would need to read the books before Christmas to have time to put together a birthday celebration for Divya by December 29th. 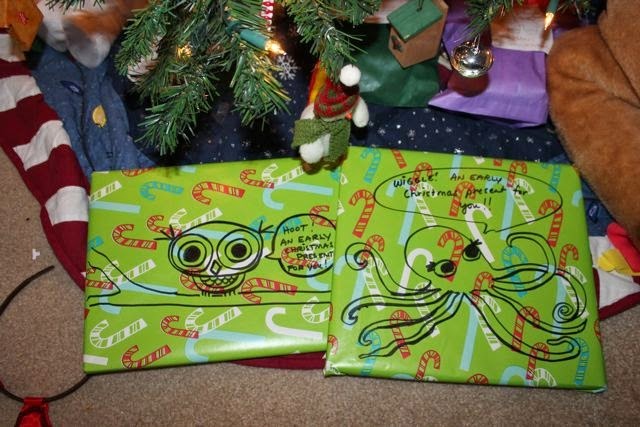 It didn't take long for my children to notice these early Christmas gifts under the tree. They loved seeing the doodles and their names that Divya drew in Octopus Alone. Also, when Divya autographed the book she wrote "Wiggle and Twirl" above her signature. These two words highlighted the part of the book that would become the inspiration for our birthday celebration activity. 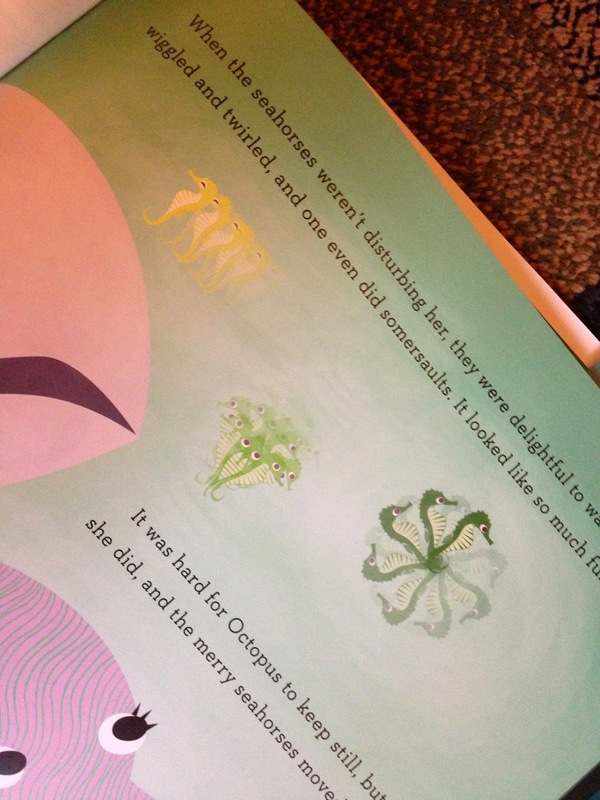 Octopus Alone is a story about a shy octopus that loves her cave at the reef. She can see all the fish, sea turtles, shrimp and squids from the comfort of her quiet cave. One day, three seahorses enter her cave and try to play, but Octopus wants to be alone. Octopus manages to sneak away, but the seahorses continue to follow. The seahorses love to play, so while Octopus hides they kept themselves busy by somersaulting, wiggling, and twirling. Octopus continues to swim away from the seahorses and other fish until she is far beyond the reef. Octopus enjoys her time quiet and alone. 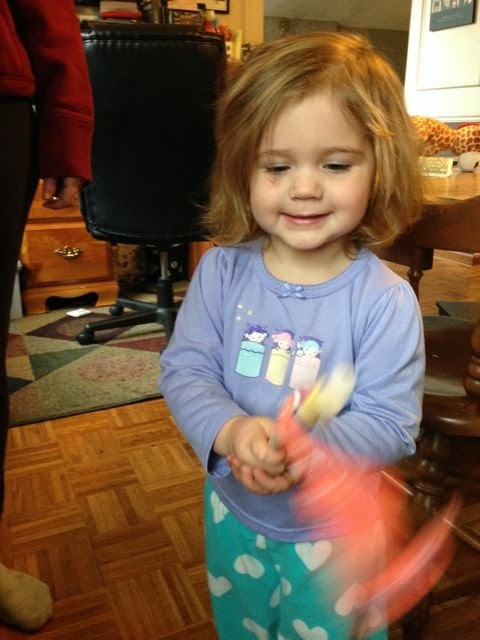 She even wiggles, twirls, and somersaults just like the seahorses. After a while, Octopus wonders about the seahorses and decides it is time to head home to see her friends. My children loved Octopus Alone. We were drawn into the book from the moment we saw the endpapers. The endpapers feature an underwater scene of numerous animals with their names written underneath. We had to read the names of the animals many times. I think they were trying to memorize them. 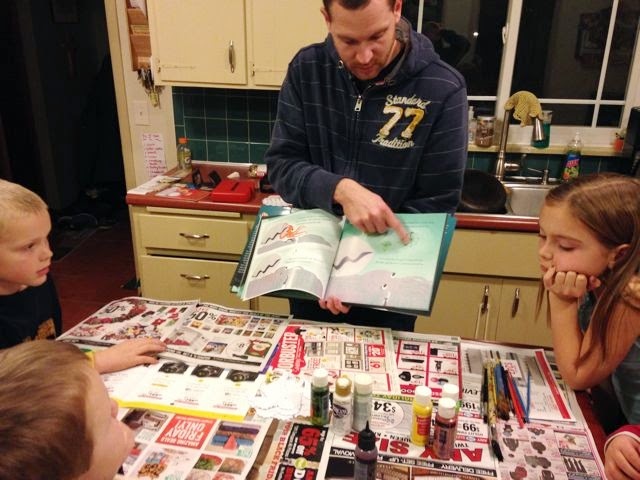 My children were excited when they found one of the animals featured on the endpapers while reading the story. 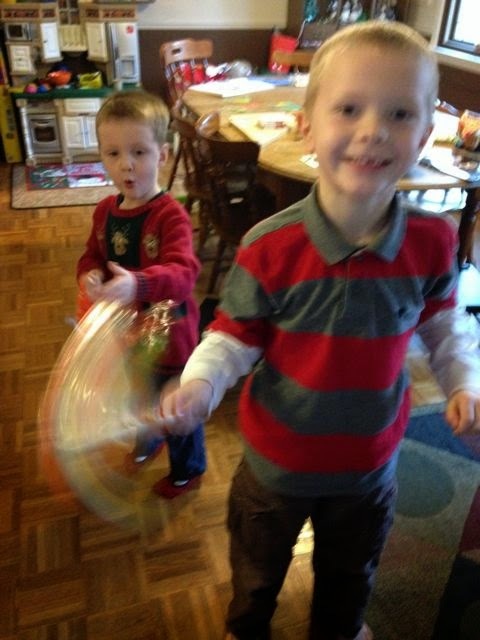 The seahorses were a huge hit too! When we reached the page where they wiggled, twirled, and somersaulted my children remembered that Divya wrote "Wiggle and Twirl"with her autograph in their book! This week, I was driving back from one of our family holiday outings with the kids half asleep in the back of our van. 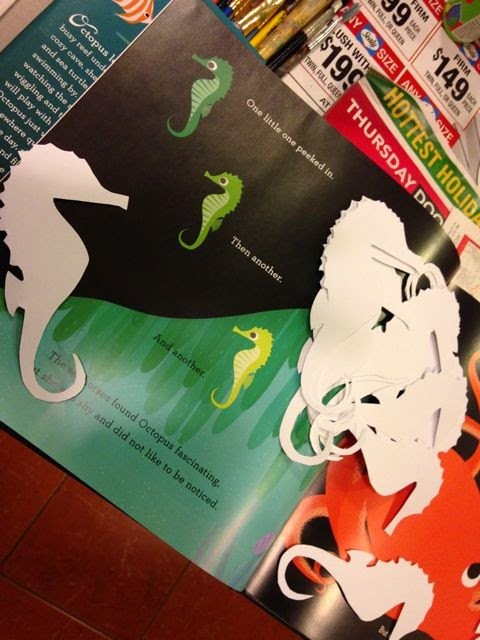 The quiet time allowed an idea to pop into my head about the somersaulting seahorses that would bring the book to life for my children. 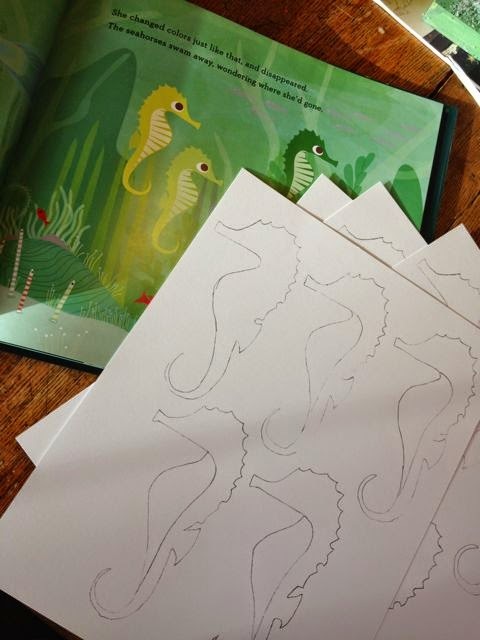 The next day, I sketched seahorses on heavy card stock paper. 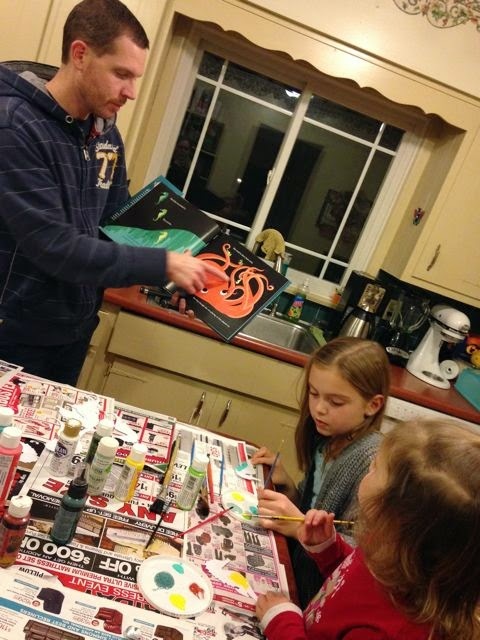 I made several copies of the paper to ensure that I had enough seahorses for my children to paint. 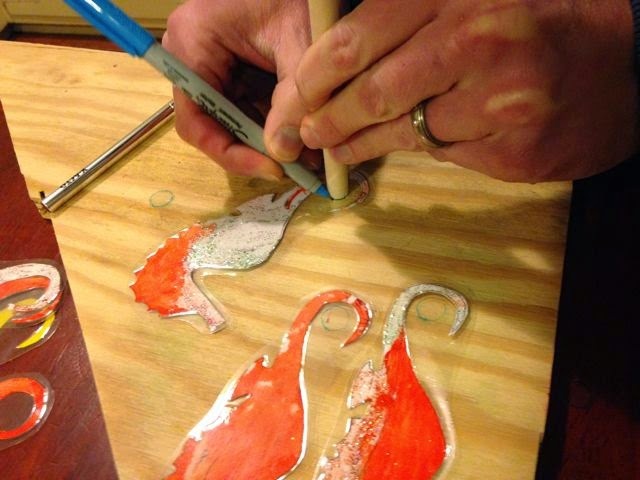 All the seahorses were cut and ready to be painted. 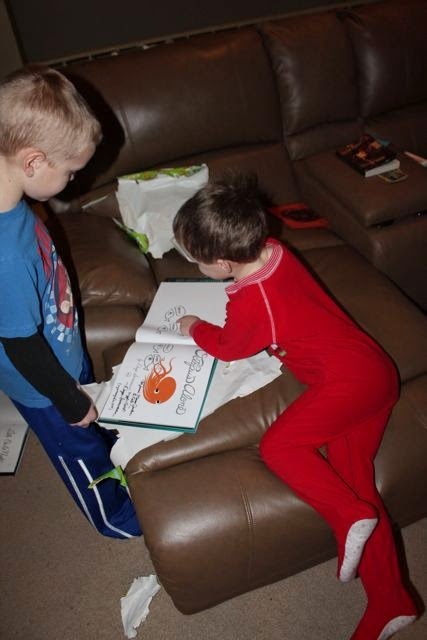 I reminded my children of the somersaulting seahorse in the book. 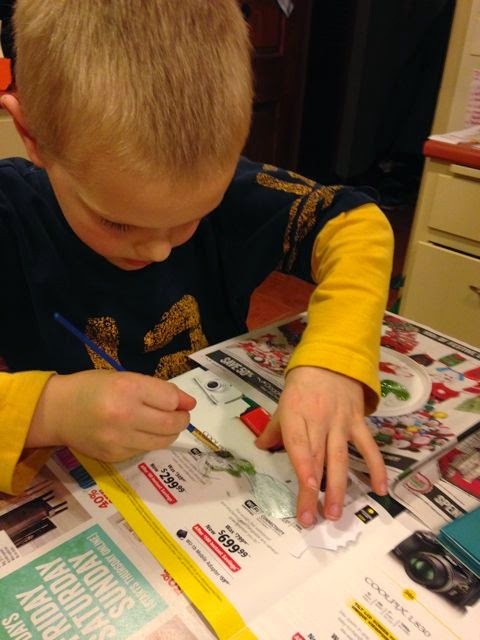 Then I explained that we were going to make a somersaulting seahorse toy out of dowel rods and the seahorse cut-outs. 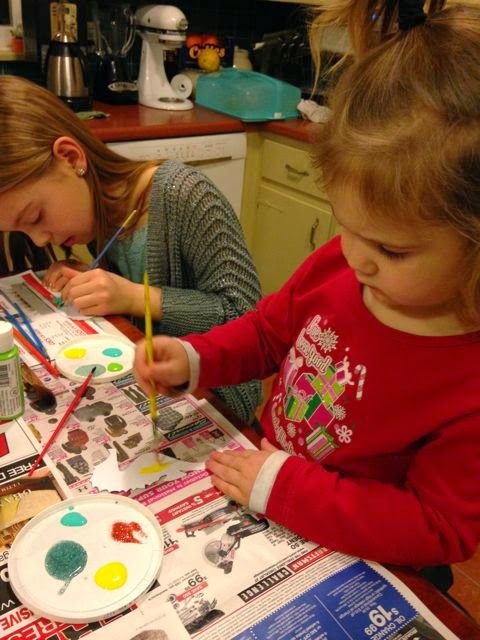 They chose to use glitter paint for some of their seahorses. My youngest daughter wanted to make a yellowish seahorse like the one in the book. 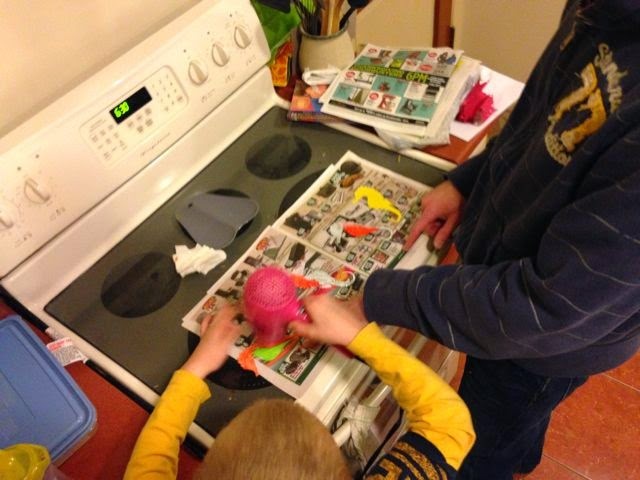 We used a hair dryer to speed up the drying process to allow us to paint the other side. Bright colors just like Divya's illustrations! My daughter suggests painting a smooth thin coat of paint. 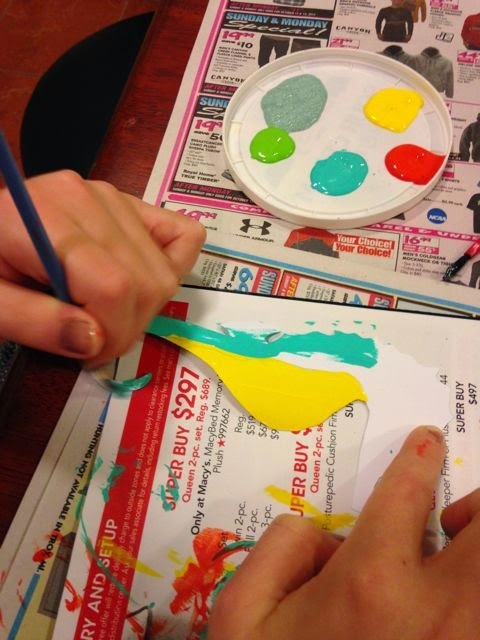 Globs of paint should be smoothed out or dabbed with a paper towel to help the paint dry faster. 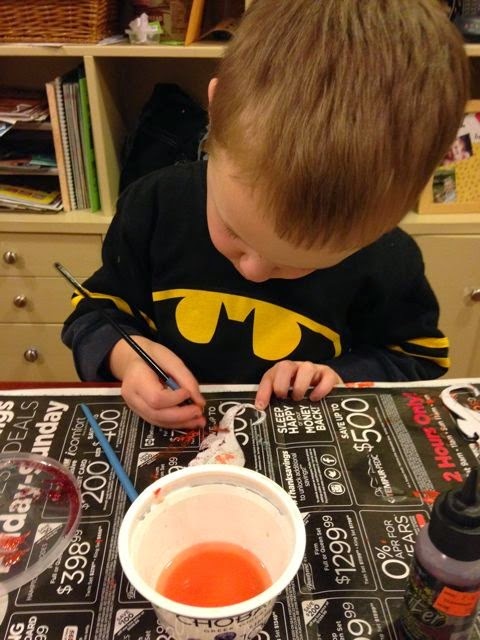 I love this little painter! 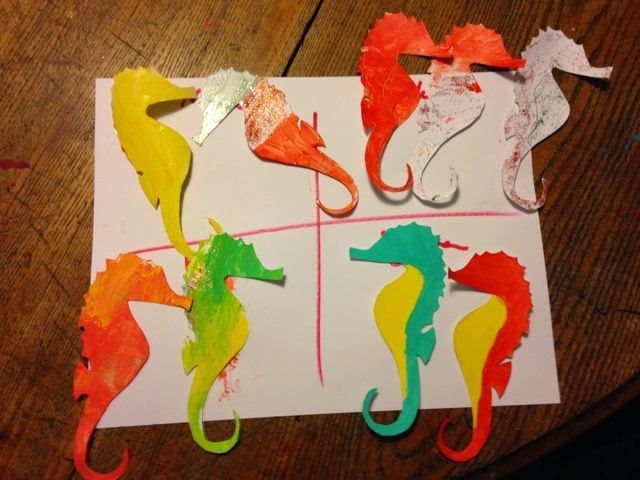 After the paint dried and the children were all in bed I laminated the seahorses. I left lamination around the tail when each was trimmed. Then, I traced the end of a dowel rod with a Sharpie marker. I used an X-acto knife to cut out the circle. 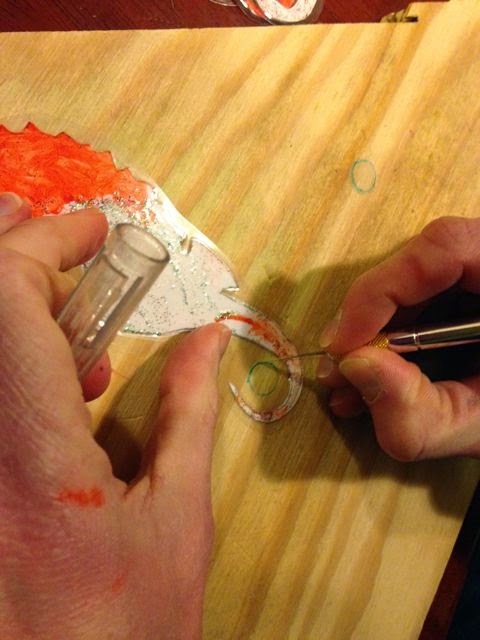 This hole allowed the seahorse to be slipped onto a dowel rod. In the morning we added googily eyes to each seahorse. We slipped the seahorses onto the dowel rod and wrapped hair ties on either side to make sure it wouldn't fly off the end. 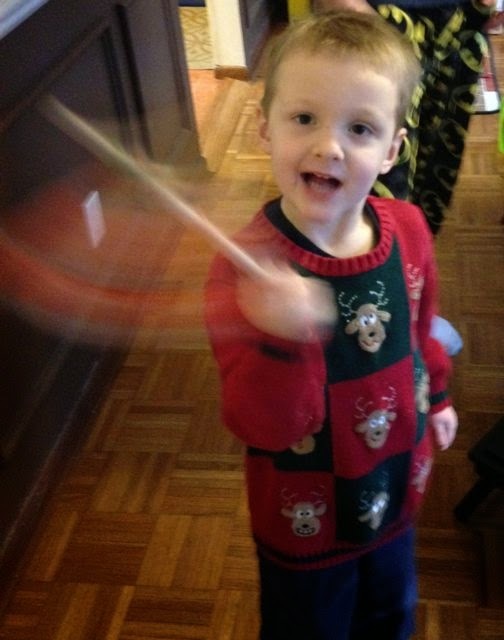 Around and around the seahorses went! Please Pin to Pinterest! Follow Happy Birthday Author! Divya, we remembered your birthday! In fact, we will be celebrating it for years to come by reading your lovely books. They will brighten our holiday season every year! Thank you so much for sharing your birthday with us and it was fantastic to meet you at Mazza. Enjoy your special day! Little Owl's Day book trailer from Divya Srinivasan on Vimeo.